Panasonic BizPads are two Honeycomb Powered Tablets that have made official by Panasonic Japan. 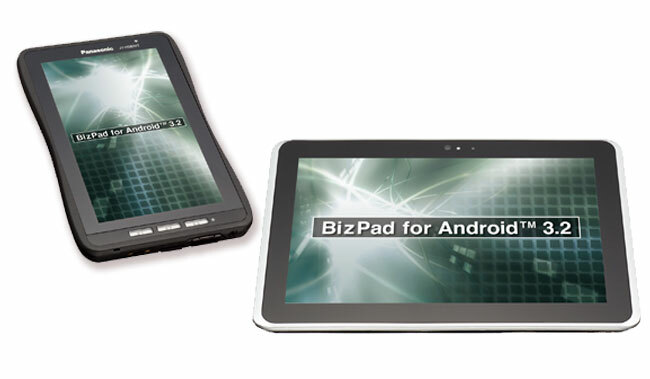 There are two Android models under Bizpad name; one is being 7 inch JT-580VT Series and second is 10.1″ JT-581VT Series. Specs of Bizpads are same and there is only difference of size. Although there is no information regarding Price of Panasonic BizPad tablets as yet but it is reported that 7 inch Tablet of Panasonic will start shipping in late December while that of 10 inch model of Bizpad will hit the web in January 2012. Panasonic BizPads are tough guy of Japan as these tablets have the great resistance power against shock , dust and water.Furthermore, they have the capability to survive even getting a few knocks and bumps during their daily use. Another thing which makes these Honeycomb Tablets perfect for use is that the user of it will be able to change the battery packs of it quite comfortably. Panasonic BizPads features are card reader/writer, NFC, security features, and optional 3G. As the tablets are running on Android 3.2 Honeycomb OS therefore the users of it will free to choose his favorite applications and games from the Android market. So would you like to buy Panasonic BizPad for your daily life? Share with us.